We all want to keep our stretchings at a certain size, but downsizing your stretched ears is often a great way to keep them healthy. You can downsize your stretchings permanently or temporarily. Downsizing allows your stretched ears to heal and recover from a variety of problems, from minor irritation to serious problems such as ear thinning. If the problem is serious you may have to stay at a smaller gauge, but in many cases you will be able to re-stretch your ears after they have recovered sufficiently. I recommend downsizing stretched ears (at least temporarily) as a possible solution for: sudden soreness that will not go away despite a salt soak; tearing; uneven stretching; ear thinning and any injury to your earlobe. Downsizing your ears allows your ears to heal. 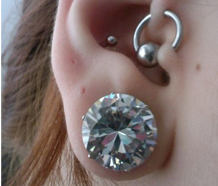 The resulting lobe is usually more resistant to minor issues but remains easy to re-stretch. However if your problem recurs despite downsizing, you may have to downsize permanently. The method for downsizing stretched ears is very simple: remove your jewellery and allow your ears to shrink at least 2mm. I recommend cleaning your ears thoroughly with a salt soak and massaging with jojoba oil – provided the skin is unbroken, You can then either leave your ears without jewellery or insert smaller jewellery to prevent too much shrinking. Give your ears a while to heal and keep a close eye on them. I recommend leaving your ears alone for at least a month before re-stretching. Re-stretching downsized ears is usually fairly simple – just go slowly and listen to your body at every step. This post is part of our Ear Stretching Guide 101 series. Click on the link to see the whole series. This entry was posted in Body Piercing Aftercare, Body Piercing Education, Body Piercing Problems, How To Stretch Piercings, Stretched Piercings and tagged Ear Piercing Aftercare, Ear Stretching, Ear Stretching Guide 101, Ear Stretching Risks, How To Care For Body Piercings, How To Stretch Your Ears, Stretched Ears on May 28, 2014 by Piercing Guru. It is always good to do your research before stretching your ears, but if you’re relying on search engines you may come across a method of dubious merit: stretching your ears with a dermal punch. As part of our Ear Stretching Guide 101 series I will explain exactly what a dermal punch is and whether you should use one to stretch your ears. What Is A Dermal Punch? Also known as a “biopsy punch”, a dermal punch is used by doctors to remove tissue for biopsy samples. You can see a typical dermal punch at the top of this post – the silver section is round and hollow with a sharp edge. It “punches” through the skin like a cookie cutter, removing a round section of tissue. Dermal punches come in a range of gauges and are disposable. Is Dermal Punching A Good Way To Stretch Your Ears? I do not recommend using a dermal punch to stretch your earlobes. This is because it removes a relatively large piece of your earlobe, including the blood vessels that supply the surrounding skin. Instead of stretching your earlobe, you have simply created a large hole. When you stretch your ears normally, you are gradually reshaping your lobes in a way that preserves the healthy tissue – dermal punching simply cuts it out. The surrounding tissue is less likely to remain healthy and is more susceptible to ear thinning. It is quick, painful and bloody, the opposite of gradual stretching. People sometimes choose dermal punching as a shortcut to a certain gauge, intending to stretch normally after that. My advice is simply to be patient and stretch your ears normally. In the end you will have healthier ears, less pain, fewer problems and potentially bigger lobes. Which Body Mods Are Dermal Punches Safe For? Dermal punches do have a place in body modification. They can be used for large gauge cartilage piercings as well as some implant procedures. Cartilage can be very hard to stretch and more likely to scar, so a dermal punch allows you to create a large gauge piercing with less risk. It goes without saying that these are complex mods that should only be performed by an experienced professional piercer. This entry was posted in Body Piercing Education, How To Stretch Piercings and tagged Body Piercing Risks, Dermal Punch, Dermal Punching, Ear Stretching, Ear Stretching Guide 101, Ear Stretching Risks, How To Stretch Your Ears, Stretched Ears on May 14, 2014 by Piercing Guru. 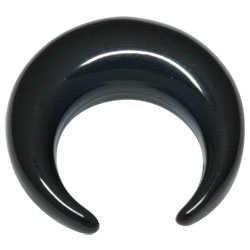 Stretching crescents are ear stretching tools that have a crescent shape. They have tapered ends that allow you to slide them gradually into your piercing, thereby stretching it to your desired size. Stretching crescents work in exactly the same way as a stretching taper, the only difference being their shape. Crescents are a great way to stretch your ears because they allow you to do so gradually and reduce the risk of tearing or blowouts. As with any ear stretching tool, it is important to use stretching crescents carefully and to do you research before you start. If you are unsure about the stretching process you can check out my post How To Stretch Your Ears, which covers most of the basic points. I would also recommend speaking to a professional piercer, as they will be able to give you specific advice based on your piercings. Before you start, ensure that your piercing is clean and fully healed. Remove your jewellery and massage the piercing with your chosen lubricant – I recommend jojoba or Vitamin E oil. This will increase blood supply and soften the skin. Clean your stretching crescent and add some lubricant to it. 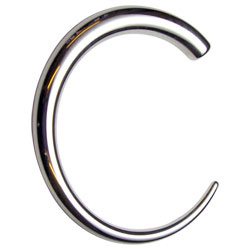 The widest point of the crescent should be your desired gauge, no more than 2mm larger than your current gauge. Insert the end of the stretching crescent into the piercing and start sliding it through the piercing. There may be a stinging sensation but it should not be painful. Continue until the widest part of the crescent is fully in your piercing. You can now either replace the stretching crescent with an unflared flesh plug, or do so once the stretching has healed. If you are going to replace it with a flesh plug, it is best to do so immediately, while the piercing is soft. It will tighten as it heals, before relaxing when healed. This entry was posted in Body Piercing Education, How To Stretch Piercings, Stretched Piercings and tagged Ear Stretching, Ear Stretching Guide 101, How To Stretch Your Ears, Stretched Ears on April 30, 2014 by Piercing Guru. Downsizing is a great way to deal with a variety of common ear stretching problems, from irritation to tears. But can you stretch your ears after downsizing? And can you go back to your previous gauge? The answer is a resounding yes in both cases: most people can stretch back to their previous gauge and beyond. The exception would be if the problem was a serious one, such as extreme ear thinning – in some cases the downsizing may have to be permanent. Every case is different, so it is important to make the right decision. If you are unsure or simply need a little advice, I always recommend consulting an experienced professional piercer. Clean your stretching taper and lubricate both the taper and your piercing with a skin-friendly oil e.g. olive, hemp or jojoba oil. Massage the piercing with the oil. Push the taper gradually through your piercing. Take your time and pause if needed. Once the taper is pushed fully through your ear, align the end of a flesh plug with the end of the taper. The plug should be the same gauge. Then push both the taper and plug through your ear until the flesh plug is fully in your piercing. As with any time you stretch your ears, I recommend stretching no more than 2mm at a time and allowing 2-4 weeks before stretching again. If you find it difficult to stretch back to your original gauge, it is likely that your ear is not yet fully healed. In most cases, you will simply need to wait a little longer before re-stretching your piercing. This entry was posted in Body Piercing Education, Body Piercing Problems, How To Stretch Piercings, Stretched Piercings and tagged Ear Stretching, Ear Stretching Guide 101, Ear Stretching Risks, How To Care For Body Piercings, How To Stretch Your Ears, Stretched Ears on April 23, 2014 by Piercing Guru. What Is The Taping Method of Ear Stretching? If you are researching ways to stretch your ears, you may have heard of the “taping method” of ear stretching. But what is the taping method? And crucially, is it a safe or effective way to stretch your ears? Now obviously I wouldn’t have posed those questions if I weren’t prepared to answer them, so in this post I will explain just what the taping method of ear stretching is! Put simply, the taping method involves wrapping tape around your stretching jewellery and then using it to stretch your ears. 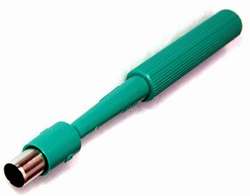 This allows you to increase your gauge by small amounts and stretch gradually to your desired gauge. The benefits of the taping method include allowing you to stretch your ears in small increments, which is ideal if you wish to stretch more slowly. It also means that you can get multiple stretching gauges from one piece of stretching jewellery, saving you money. 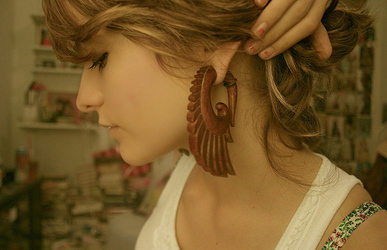 You can also create in-between gauges that may be hard to find or expensive larger sizes. As with any ear stretching method, it is important to do your research, using high quality materials and listen to your body. I recommend reading our general guide to How To Stretch Your Ears before attempting the taping method, as it will tell you all you need to know about stretching speeds and how to avoid common ear stretching risks. I recommend using high quality PTFE tape, also known as plumber’s tape or Teflon tape. PTFE tape is made from a biocompatible plastic that is also used to make body jewellery. It is non-toxic and will not irritate your skin. It is very thin, which allows you to build up the diameter gradually. Do not use electrical tape, because the adhesive on the tape may contain carcinogens and other harmful chemicals. Begin by wrapping a couple of layers of tape around your stretching taper. I do not recommend stretching more than 2mm at a time. Smooth out any wrinkles in the tape. Lubricate with plenty of your chosen oil. Insert slowly into your piercing. This should merely be uncomfortable and you should never have to force the jewellery through. If the taper will not go in or you experience sharp pain, stop. You may have added too much tape or not enough lubricant. Remove a layer of tape and try again. Once the taper is in your ear, you can either slide it all the way through and insert appropriately sized jewellery, or allow it to heal for a few days before adding more tape. I always recommend inserting jewellery, but you know your body best. For full information on ear stretching aftercare, please see my post How To Stretch Your Ears, Part 2. This entry was posted in Body Piercing Education, Body Piercing Tools, How To Stretch Piercings, Stretched Piercings and tagged Ear Stretching, Ear Stretching Guide 101, Ear Stretching Jewellery, How To Stretch Your Ears, Stretched Ears on March 12, 2014 by Piercing Guru. 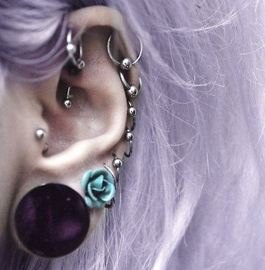 Of all the jewellery that you can wear in your stretched ears, ear weights are one of the most eye-catching. 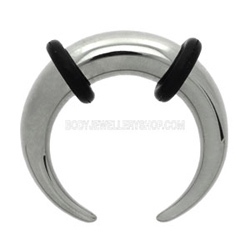 Ear weights are essentially heavy pieces of jewellery that you can wear in stretched ears. Unlike flesh plugs or tunnels, ear weights are not designed to fill your piercings. Instead they hang from your stretched piercings, leaving most of the hole visible. The image on the right shows a typical ear weight, with a spiral shape that simply hooks into your ear. Like most ear weights, it has decoration at the bottom of the weight and is inspired by elegant tribal style. Ear weights are also one of the most ancient forms of stretched ear jewellery, with examples being found dating back thousands of years, particularly in Africa and South America. 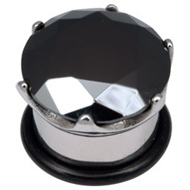 You can find a huge variety of ear weights for stretched ears. They can be made in lots of different materials but the most popular are brass, wood and stone. It is worth remembering that ear weights are worn for decoration, not to actually stretch your ears. They are suitable for healed, established stretchings only and should be removed at night. Ear weights make beautiful jewellery but they are not suitable for stretching your ears with. This is because ear weights focus all their weight on one part of your piercing. The result is that they only stretch the bottom part of your piercing; leading to uneven stretching, ear thinning and even ear splitting. A healthy stretched ear should be equally stretched all around the piercing, and the flesh should be of equal thickness all the way around. Stretching tapers are the safest way to stretch your ears and you should wait until your piercings are fully healed before wearing ear weights. This often takes at least two months. Once your stretchings are fully healed you can wear ear weights, although they should not be worn for extended periods and always removed at night. With proper care and healing time, ear weights are completely safe to wear and a wonderful way to show off your stretched ears. This entry was posted in How To Stretch Piercings, Stretched Piercings and tagged Ear Stretching, Ear Stretching Guide 101, Ear Weights, How To Stretch Your Ears, Stretched Ear, Stretched Ears on March 5, 2014 by Piercing Guru. During the process of stretching your ears you may notice an unfortunate side effect – the smell! Some people are lucky enough to never suffer from ear funk but it is common when you first stretch your ears. It may not be pleasant but never fear – stretched ear odour is completely normal and easy to get rid of. So what causes the stretched ear odour? Odour is the result of sebum and dead skin cells being trapped between your skin and jewellery. Your skin produces oil called sebum that keeps it soft and healthy, as well as shedding dead skin cells. This happens all over your body, but if these products become trapped under jewellery, they can lead to odour. It does not mean that your ears are disgusting, but they do need to be kept clean – just like the rest of your body. The best way to reduce odour from stretched ears is to practice good hygiene and wear skin-friendly jewellery. I recommend cleaning your stretched ears a couple of times a week – any more and you may irritate the skin. The easiest way to clean your stretchings is in the shower – simply remove your jewellery and clean thoroughly with warm water. You can also use unscented anti-bacterial soap if needed. After you have finished bathing, massage your ears with natural oil or moisturiser e.g. jojoba oil, cocoa butter, Vitamin E oil etc. Then reinsert your clean jewellery. It may also help to remove your jewellery regularly to allow the skin to breathe. Many people find that ear odour reduces when they reach their desired gauge and allow their ears to heal fully. While you are still stretching your ears, they rarely get the chance to “settle” and heal fully, so the skin may produce excess build-up. Once they are left alone for a while, build-up reduces and so does odour. You should also avoid using alcohol-based substances to clean your stretching gear. This will dry the skin, causing it to produce excess oil. Unscented anti-bacterial soap is sufficient and will not interfere with your skin’s natural processes. 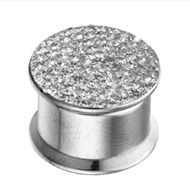 Jewellery can also make a big difference to stretched ear odour. Most people notice increased odour when they wear acrylic jewellery, because it can accumulate bacteria. Wooden jewellery, on the other hand, tends to greatly reduce odour and most people find that their ears do not need cleaning as often. Wooden plugs and tunnels allow your skin to breathe and also irritate the skin less, so it produces less build-up. Silicone jewellery may also reduce the odour – it is non-porous and non-reactive, so it does not accumulate bacteria or irritate the skin. Personally I wear either wood or silicone tunnels and clean/massage my ears once a week. This works for me and I do not get any odour at all from my stretched ears. Everyone is different, but with regular cleaning, massaging and appropriate jewellery you should be able to reduce stretched ear odour once and for all! This entry was posted in Body Piercing Aftercare, Body Piercing Education, Body Piercing Problems and tagged Body Piercing Care, Ear Piercing Aftercare, Ear Stretching, Ear Stretching Guide 101, Ear Stretching Risks, How To Care For Body Piercings, How To Stretch Your Ears, Piercing Aftercare, Stretched Ears on February 19, 2014 by Piercing Guru. Welcome back to our instructions on how to stretch your ears! In Part 1 we discussed how to determine your current gauge and what materials you will need. Remember, ear stretching is safe but it is always important to take care. If you feel that something is not right, stop immediately and consult a professional piercer. Now we can move on to the actual stretching method and start stretching your ears! The best time to stretch your ears is after a hot shower, when the skin is soft and malleable. I recommend stretching no more than 2mm at a time. Your piercing should be fully healed – at least 4 to 6 months since it was pierced. Never stretch a piercing that feels or looks sore – wait for it to calm down before you stretch. I recommend stretching one ear at a time. It is usually uncomfortable to sleep on a freshly-stretched piercing, so this allows you to sleep on the unstretched side. Plus, it means that you can focus on one side at a time and then bring the other ear up to the same gauge – don’t worry, you’ll only be lopsided for a short time! Wash your hands and gather your tools. As discussed in Part 1, you will need a stretching taper and unflared flesh plug in your desired gauge. You will also need a suitable lubricant, such as jojoba oil. Clean and dry your stretching taper and jewellery thoroughly. Remove current jewellery and massage your piercing with your chosen lubricant. This will help to soften the skin. Apply a little lubricant to the small end of the stretching taper and begin to push it slowly into your piercing. Pay attention to how it feels. Some soreness or discomfort is normal, but you should not feel sharp pain or strong resistance while stretching you ears. This is a sign that you are not ready to stretch to the next size yet – perhaps your ears are not fully healed? This can be frustrating, but try to be patient and never simply push through the pain. This can lead to skin tears and blowouts, which can leave permanent scars. Continue to push the taper through your ear. If you feel that you need to pause for a moment, take your time. Once the taper is pushed fully through your ear, align the end of the flesh plug with the big end of the taper, as if it were part of the taper. Then push both the taper and jewellery through your ear until the flesh plug is fully in your piercing – congratulations, you have just stretched your ear! Place an O-ring on either end of the flesh plug to keep it in place. Freshly-stretched ears require little aftercare, but it is important to pay attention to how it feels. Your ear may feel hot and a little sore, but sharp pain or bleeding are not normal and indicate that you may have damaged your ear. If this happens, downsize to your previous jewellery, clean with saline and allow your ear to heal fully before stretching again. Assuming you have stretched your ears successfully, the best aftercare is to leave your ears alone for a few days. Sleep on your other side and take care not to bump them when you get dressed. You should also keep your hair away from the stretching. You can use saline to clean around the jewellery if needed, but this is not often necessary. After stretching, your ears may take up two months to heal fully. Always allow 1-2 months before stretching again – even if they feel fine. This allows the fistula (piercing hole) to stabilize and fully adjust to its new size. I also recommend waiting 1-2 months before wearing flared jewellery – doing this too early can irritate the fistula. After 1-2 months the piercing should no longer feel tight around the jewellery and you should be able to remove it easily. Massaging the piercing with oil can help increase softness and blood circulation to the stretching. Once your stretching is stable and no longer feels tight, you are ready to stretch up to the next size. Follow the same method and remember to stretch slowly to avoid damaging your ears – everyone’s ears are different but you should always err on the side of caution to avoid permanent damage. Happy ear stretching! This entry was posted in Body Piercing Education, How To Stretch Piercings and tagged Ear Stretch, Ear Stretching, Ear StretchingGuide 101, How To Stretch Your Ears, Stretched Ears on February 12, 2014 by Piercing Guru. One of the main concerns people have about stretching their ears is how noticeable stretched ears can be and how to hide stretched ears for work. There are ways to hide stretched ears, but I think it is important to be realistic – it is impossible to make your stretchings completely invisible, especially at larger sizes. There are however plenty of ways to make your stretched ears more discrete and less “offensive” to employers and judgmental family members. The most basic – and least popular – option is to limit the size of your ears. The simple fact is that small stretchings are easier to hide than large ones. In the end it is a balancing act – the size you would like vs. the practicalities of your job etc. When it comes to hiding your existing stretchings, having long hair is always an advantage! Simply wearing long hair down can go a long way towards hiding stretched ears, especially if people don’t know that you have them in the first place. However the best way to hide your stretchings is with discrete jewellery, as detailed below. Hider plugs are flesh-coloured flesh plugs. They are designed to blend in with your ear lobes and make your stretchings more discrete. The most effective are Kaos Silicone Hider Plugs. They have a realistic skin colour and a tapering edge that helps them blend into the surrounding skin. Unfortunately they only come in one colour. If your skin tone is darker, your best bet is to look for other plugs that match your skin tone as closely as possible. Even if the hider plugs do not match your skin colour exactly, they can make your ears look much more discrete – especially from a distance. If your stretchings are under 10mm, you may find that you can hide them simply by wearing plugs that look like stud earrings. By choosing a style that could conceivably be a regular stud, you can hide your stretchings quite easily. Remember, they might be obvious to someone familiar with stretched ears, but people often see what they expect to and may not notice your stretchings. The example on the right would probably not get a second glance from most people! 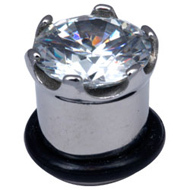 For best results I recommend one of the jewelled plugs below or any solid, opaque flesh plug. This entry was posted in Hiding Your Piercings, How To Stretch Piercings and tagged Ear Stretched, Ear Stretching, Ear Stretching Guide 101, How To Stretch Your Ears, kaos hider plug, silicone hider, silicone hider plug, Stretched Ear, Stretched Ear Piercing, Stretched Ears on December 23, 2013 by Piercing Guru. When researching how to stretch your ears or reading others’ stretching experiences, you may hear the term “dead stretch” or “dead stretching”. But what exactly is dead stretching? Put simply, dead stretching means going up a gauge by simply pushing a larger piece of jewellery into your piercing, without using a taper. So to dead stretch from 6mm to 8mm, you would simply force a 8mm plug into the piercing. I do not recommend dead stretching as a healthy way to stretching your ears. It puts unnecessary pressure on the piercing and can lead to all sorts of issues. Using a taper is safer and more comfortable, even if you think that you could easily get larger gauge jewellery into your stretching. 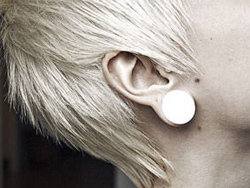 Dead stretching your ears greatly increases the risk of blow-outs, earlobe tearing and uneven stretching. It is usually more painful than stretching with a taper – even if you can force the jewellery through pain-free, you are likely to experience pain and/or other issues soon after. The risks are even worse if you do not use lubrication when you dead stretch. To force larger jewellery through your stretching, you may have to use quite a lot of force. This puts a lot of pressure on the stretching and can distort it, leading to the aforementioned risks. Stretching is healthiest when the pressure on and trauma to the earlobe is minimised – by using lubricated, tapered jewellery and stretching gradually. This entry was posted in Body Piercing Education, How To Stretch Piercings, Stretched Piercings and tagged Dead Stretch, Dead Stretching, Ear Stretching, Ear Stretching Guide 101, How To Stretch Your Ears, Stretched Ears on November 20, 2013 by Piercing Guru.